This article was published in the Fall 2016 Baseball Research Journal. Welcome to nineteenth-century baseball research, where it is not uncommon for the newspapers to have conflicting box score data, and for the box score data to be in conflict with the written article covering the game, or the scoring data included with the box score to be in conflict with the data in the box score itself. This makes researching nineteenth century baseball challenging, but also very rewarding once all the pieces are put together in an accurate manner. While the published box scores support that Farrell had eight assists in the May 11 game, what is not supported is how the assists were acquired. The record books state that all eight of Farrell's assists were the result of throwing out baserunners attempting to steal. The 1898 Reach Guide goes so far as to claim that all eight were thrown out at second base. But I was familiar with this game from previous research and upon seeing the record books I questioned, “Was it eight?” I reviewed my game file: Two newspapers stated that Farrell threw out only six baserunners, not eight. The discrepancy spurred me to dig deeper into the facts of the game. a) Only six, not eight, baserunners were thrown out in an attempt to steal. b) Not all of the six were thrown out at second base. c) John McGraw was not one of them. The Baltimore Sun described Keeler’s resulting outburst: “Hurst called Keeler out on third base once, and so surprised and angry did that usually quiet player become that he ran at Hurst like a cyclone.”10 Technically the Keeler out at third was a pick off, not a caught stealing, thus only five of the six Farrell throw-outs were to catch a player in the act of trying to steal a base. According to the game box score (see Figure 1) Duke Farrell had one put out, eight assists, and zero errors. Baltimore’s Joe Kelley was caught in a rundown between third and home in the first inning. Kelley was tagged out by DeMontreville, but presumably Farrell assisted on the play which would account for the seventh assist. The second inning saw Joe Corbett sacrifice and presumably Farrell assisted on the out for the eighth assist. The second inning also featured a put out at home plate when Boileryard Clarke was called out. Presumably the put out was by Farrell. In addition to the eight Farrell assists, the game featured two other noteworthy incidents, both involving Jack Doyle, the Baltimore first baseman. Before his expulsion Jack came very near putting Willie Keeler out of the game for a long time to come. Doyle is an ambitious player, who takes every chance that offers to win a game. A short fly went up to right field, and Doyle and Keeler both went for it. The ball was in Keeler’s territory, but Jack, without warning, pursued the ball, and the result was a violent collision with Keeler. Keeler was momentarily stunned by the shock, and for a few minutes lay motionless upon the grass. It was at first thought that he was seriously injured, for both players were running at full speed when they came together. Physician McJames, however, diagnosed a speech that Jack Doyle made at the home plate, and pronounced Jack's English as suffering from a compound fracture. Jack’s sprained English was passed at Umpire Hurst because Tim called a strike on Jack, who had $25 worth of conversation with Tim, and was finally ordered to beat an exit from the grounds. O’Brien, the Orioles’ substitute outfielder, replaced Jack at first. There was enough scrapping by the players and kicking against the umpire to please the most exacting lover of excitement. Jack Doyle figured in animated debate with Tim Hurst, and the result was that Jack was not only banished from the game, but he was ordered out of the grounds, with a heavy fine chalked up against him. In the third inning Doyle was put out of the game and out of the grounds because of his objection to a strike being called on him. Up to that time Hurst had been doing fairly well, and the strike called on Doyle was certainly not a flagrant error, if an error at all, but from that time forward Hurst gave everything against the visitors. The newspaper box scores don’t agree on the number of hits (H) or at bats (AB), either. The Baltimore American lists eight hits for the Orioles, while the Washington Post lists 10 and the Baltimore Sun 12. The discrepancy undoubtedly has to do with which errors were deemed to have occurred. 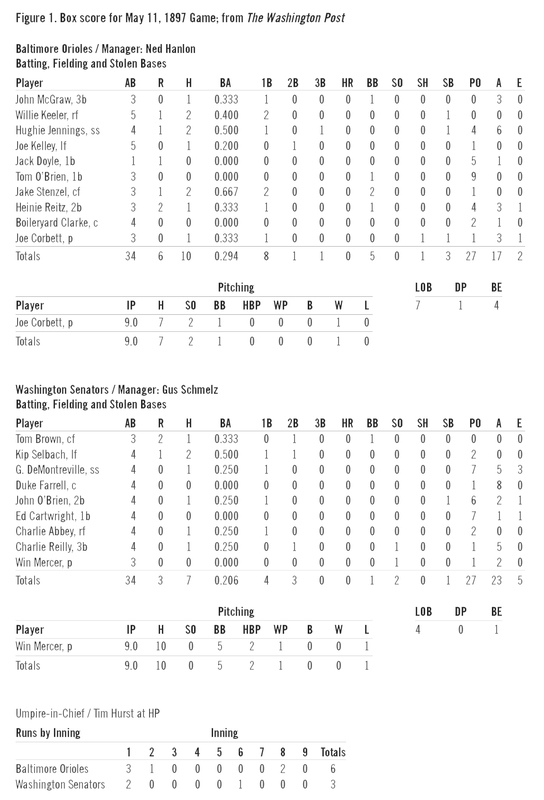 The individual ABs in the Baltimore American box score didn’t make sense from a plate appearance point of view. John McGraw, who played third base and batted first for the Baltimore Orioles, was listed as having four AB, one base on balls (BB) and one hit by pitch (HBP): six plate appearances. Four batting order positions after McGraw was the combination of Jack Doyle and Tom O’Brien (O’Brien replaced Doyle in the third). Doyle had one AB, O’Brien had three, totaling four—but O’Brien also had a BB which meant a total of five plate appearances. No problem there except for the fact the preceding batting order position—Joe Kelley, who batted fourth—only had four plate appearances. 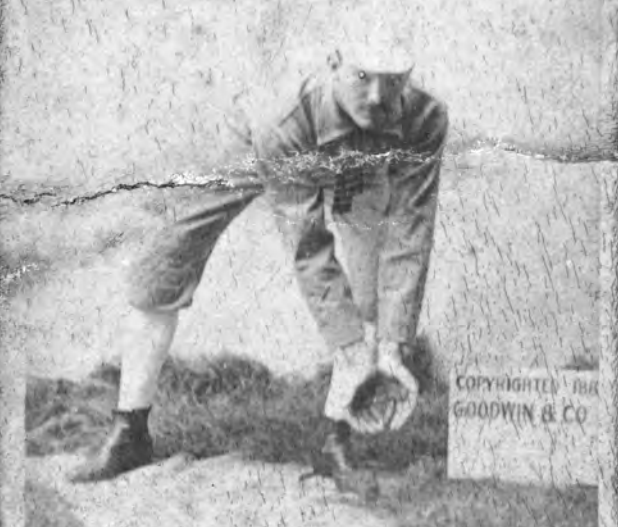 To further muddy the waters, the seventh and eighth batters—Heinie Reitz and Boileryard Clarke respectively—only had four plate appearances each, but Joe Corbett, batting ninth, had five: four AB plus one sacrifice hit. How can a later batting order position have more plate appearances than an earlier position? It’s impossible. The Washington Post box score (see Figure 1 on page 106), on the other hand, made much more sense: The BB, HBP, and the SH add up properly relative to the ABs. All 42 plate appearances—five for the first six positions in the batting order, four for the latter three— can be validated by summing the AB (34), BB (5), SH (1) and HBP (2). Another conundrum was served up by the Baltimore American. They stated that Washington’s DeMontreville and Selbach had sacrificed, DeMontreville in the first inning and Selbach in the sixth. None of the box scores listed either of them with a sacrifice hit, including the Baltimore American itself. This nonlisting makes sense from a plate appearances point of view given that each player was credited with four AB, zero BB, and zero HBP. The American likely labeled the DeMontreville and Selbach efforts improperly. 1. A.J. Reach. Reach’s Official Base Ball Guide for 1898. Philadelphia, Pennsylvania: A.J. Reach Co., 1898. Reprinted in 1990 by Horton Publishing Company. 2. John B. Foster, Editor (Compiled by Charles D. White). Spalding’s Official Base Ball Record, part of the Spalding “Red Cover” Series of Athletic Handbooks, No. 59R. New York, NY: American Sports Publishing Company, 1924. 3. John B. Foster, Editor (Compiled by Charles D. White). The Little Red Book: Spalding’s Official Base Ball Record, part of the Spalding’s Athletic Library, No. 59B. New York, NY: American Sports Publishing Company, 1928. 4. Leonard Gettelson, Preparer. One for the Book for 1963: Complete All-Time Major League Records. St. Louis, MO: Charles C. Spink & Son (The Sporting News), 1963. 5. Seymour Siwoff, Editor. The Book of Baseball Records. New York, New York: Seymour Siwoff , 1982. 6. “A BATTLE OF PITCHERS: In Which Joe Corbett is Ahead of Mercer,” Baltimore American, Wednesday, May 12, 1897, page unknown. 7. “MERCER THEIR CINCH: Has Never Pitched a Winning Game Against the Orioles,” Washington Post, Wednesday, May 12, 1897, 8. 8. “HARD TIME WITH HURST! : Corbett Saves the Game,” Baltimore Sun, Wednesday Morning, May 12, 1897, 6. 9. Washington Post, op. cit. 10. Baltimore Sun, op. cit. 11. Washington Post, op. cit. 12. Baltimore American, op. cit. 13. Baltimore Sun, op. cit. 14. Washington Post, op. cit. 15. Baltimore American, op. cit. 16. Baltimore Sun, op. cit. 17. Baltimore American, op. cit. 18. Washington Post, op. cit. 19. This is true not only in baseball research and records. I recall having those exact thoughts at the time I discovered that Jim Brown, the famous running back for the NFL Cleveland Browns, had actually gained over 1000 yards rushing—1016 to be exact—in the 1962 season rather than the 996 yards he was credited with. See Brian Marshall. “Rushing to Judgment: Recovering Jim Brown’s Lost Yardage from 1962.” The Coffin Corner, Volume 35, Number 3, May/June 2013, 9–12. 20. “Baseball Notes,” Baltimore Sun, Friday Morning, May 21, 1897, 6.